Keep your business running and protect your expensive equipment with an Uninterrupted Power Supply (UPS). R&D Technology supplies UPS systems and voltage regulators to protect devices from power surges and reduce the fluctuation of input voltage. Our power systems are Australian-made and designed to provide a clean, reliable supply of DC and AC electricity in any setting. You can be confident our UPS systems will protect your sensitive devices at all times. Stop worrying about power outages disrupting your business. R&D Technology are the experts in backup power solutions. 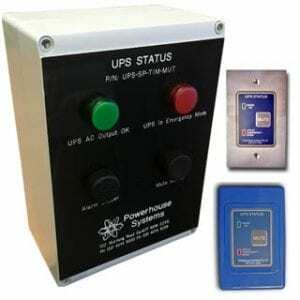 Our UPS systems keep light and heavy industrial machinery working efficiently in any scenario. No more loss of productivity and data from power outages – just keep running your business as usual. Whether you’re powering a room of servers, items in remote areas or critical power applications – a power supply will keep your sensitive devices safe from harm. In the unlikely event a UPS system fails or needs maintenance, you need to switch off any connected devices to have the work done. This is a problem for critical power applications that need to run at all times. A Maintenance Bypass Switch solves this problem. With a bypass switch in your system, you can perform routine maintenance and repair your UPS without turning off any equipment. Switch the MBS to bypass and the load will now feed directly to the mains power – problem solved. The R&D Technology team have over 20 years of experience in designing and installing power protection systems. If you need help with choosing any Uninterruptable Power Supplies for your business, an R&D sales team member will be happy to help you. R&D Technology is a recognised leader in the supply of power protection systems for Australian businesses. Our durable solutions ensure both industrial and commercial sectors can stay compliant with today’s energy demands. And maintain productivity with an uninterrupted supply of electricity. Contact us for expert advice about our UPS systems from an R&D technology team member.